If you have any questions which are not answered below, please call us on (03) 5975 5551 or submit an enquiry. What is the difference between the APR and MSF mailbox? The external dimensions of the APR are larger as this model includes framework around the outside of the mailbox bank or single box. The internal width and depth of the APR and MSF mailboxes are the same. Both the APR and MSF mailboxes are designed to receive A4 mail. The height of the APR can be modifed (lowered) for situations where there are height restrictions. What is the difference between the APR2 and the APR3, and the MSF2 and MSF3? The APR2 and MSF2 mailboxes are wider across the front and are designed to receive A4 mail "landscape". The APR3 and MSF3 mailboxes are narrower across the front but deeper and are designed to receive A4 mail "portrait". 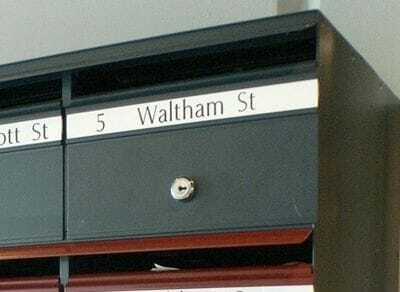 Where are the Series 7 and Series 7L mailboxes used? The Series 7 and Series 7L have the same appearance as the APR mailboxes, with framework around the outside of the mailbox bank or single box. These mailboxes are lower in height, and also have a reduced depth of 210mm which may be suitable for applications where there is a depth restriction. The Series 7 and Series 7L cannot receive A4 mail flat. Please refer to our dimension charts when calculating mailbox bank sizes. Mailbox bank external dimensions are not multiples of single boxes. Internal mailbox dimensions are the same. Should the mailbox door be at the front or the rear? You need to determine if the mailbox location is more suitable for retrieving the mail from the front or the rear of the mailbox. For example, there may be plants situated behind the mailbox which will hinder access to a rear door. All mailbox models can have the door at the front or the rear. Rear retrieval mailboxes cost slightly more than front retrieval. At what height should mailboxes be installed to conform to Australia Post requirements? 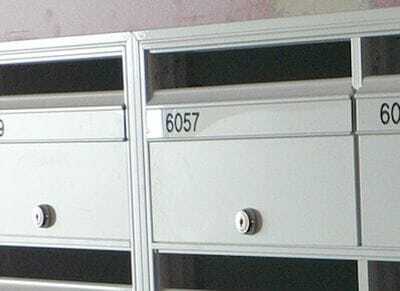 With mailbox banks, Australia Post requires that the lower mail slot be 600mm from the ground and the top mail slot be no more than 1600mm off the ground. To meet these requirements, we recommend that the bottom of the mailbox bank be a minimum of 470mm off the ground, and the top of the mailbox bank be a maximum of 1635mm off the ground. Single mailboxes should be mounted between 900mm and 1200mm from the ground. What colours are available for the mailbox finish? Mailsafe offer 30 powdercoat colours which are included in the standard price. These colours can be seen here. A natural anodised finish is also available at the standard price. Non-included colours may be supplied at a surcharge. Note that Dulux Duratec colours cannot be supplied. Is a unit or street number included with the mailbox? Each mailbox includes an engraved number strip. There are five number strip colour options and 21 engraving font options. These options can be viewed here. Gold box number strips attract a surcharge. Can a box number strip be changed? Replacement box number strips can be ordered from us - supply and delivery only. The number strips supplied with the mailboxes are fixed in place with silicone on the back. What are Mailsafe wall mounts? Wall mounts are strengthened fixing points that are predrilled in the rear panel of the mailbox bank. This is an optional item. What is the lead time for manufacture of the mailboxes? The lead time for manufacture of the mailboxes is approximately 3 to 4 weeks, depending on the model chosen and the quantity. Two to three business days should be allowed for delivery upon completion of manufacture. Mailsafe Mailboxes are made to order to suit your project requirements. We carry a limited supply of single Mailsafe Mailboxes in a natural anodised finish. Mailsafe Mailboxes are manufactured in Brisbane and delivered directly to your building site. Our mailbox service is for supply and delivery only. Are custom sized mailboxes available? Mailsafe can manufacture custom sized mailboxes. However, as the mailboxes are manufactured using a system, there are certain elements of the design which cannot be customised, such as the door hinge (doors always open upwards), or the type of materials used. We are happy to discuss your custom mailbox requirements. Replacement mailbox keys can be supplied. Orders for replacement keys must be in writing - orders are not taken over the phone. Please contact our office on 5975 5551 to obtain a replacement mailbox key order form. Replacement keys are cut and mailed from Brisbane within 5 to 7 days.